"My Chemical Romance", a band hailing from Newark, New Jersey, is not your typical rock band. They all claim to have grown up in strange households over the years, which may have influenced some typically "strange" behavior coming out of this rock group sensation. The band technically got started when Gerard started writing songs, calling over buddy Matt Pelissier to help out. Ray hadn't been playing guitar seriously for about three years, but went over there anyway to check things out. He went to practice in their attic and ended up being blown away by the style of music and writing Gerard had done. It was a real dark, edgy theme, still containing a slight pop element. After a couple weeks a practicing there was an obvious energy they felt playing together. The band’s name comes from an Irvine Welsh novel, and was suggested by Gerard’s younger brother, Mikey. The younger Way brother started playing bass with them, and soon they got Frank a couple months later to fill out the other guitar spot. He happened to be in another band that had helped them get some of their first shows. When the band broke up their first instinct was to use him. Frank was already a fan of the band and an excellent guitar player. They were all in that stage of their life where you are kind of at that crossroads where you can either go one way or another. It worked out that they could all come together and form My Chemical Romance. They were extremely lucky to find each other and are even luckier to be where they are now. Gerard Way (vocals), and his brother Mikey (bass), are two of the group members, as well as Frank Iero (guitar), Ray Toro (guitar) and Bob Bryar (drums). This particular band says they emerged from the New York/New Jersey Punk Scene, which had a major influence on them as teenagers. Guitarist Frank Iero has been in bands since he was 11 years old, being allowed to practice in the basement as long as his schoolwork was getting done. 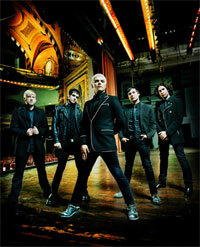 My Chemical Romance has been through a lot of labels, first being called "emo", moving onto "vampire and zombie" rock. They believe if you like the record, you like it, whatever it is. Their sound has been describes as Queen meets the Misfits. The band has been banned from Orange County, CA. My Chemical Romance were the surprise breakthrough act of 2005, gaining themselves the highly coveted support slot on the last Green Day world tour. Following the success of "Three Cheers For Sweet Revenge", the band began recording their follow-up record in April of 2006. Tentatively titled "The Rise And Fall Of My Chemical Romance," the real title, "The Black Parade" was announced in August of 2006 by Gerard while performing at the Hammersmith Palais in London. Having reached the #1 chart position in numerous countries and selling over $380, 000 copies in it's first week alone, The Black Parade is set to define My Chemical Romance as the artists for the new generation. To make their second album Three Cheers for Sweet Revenge, MCR (as most people call them nowadays) had to pull themselves off the road that had accompanied them for so long. It was the only way they could have put out a decent record, and, oh boy, was it decent. "Three Cheers for Sweet Revenge" is what everyone's calling "violent, unsafe pop music". The band has said it "Rose from the ashes following the tragic events of 9/11". Gerard's artwork is featured on the cover of the album, and was inspired by the band's love for horror movies, comic books, and science fiction. The story of the previous album continues in Three Cheers. The story is about two lovers that break up, but reunite when their hometown is invaded and over run by vampires. The female (dubbed as "Helena" on some fansites) ends up being bitten by a vampire and is sent to a hospital where she soon dies with a spike through her heart from her lover. The male continues to live, but realizes that he cannot continue living without her, and kills himself. October 24th 2006 saw the release of "The Black Parade", My Chemical Romance's third and newest studio album. Produced by Rob Cavallo (Green Day) and featuring the guest vocals of Liza Minelli and the parents of Frank Iero and Gerard and Mikey Way; the band hit the studio in April 2006 to make their third concept album. The story of The Black Parade centers around a character called "The Patient" who has suffered an untimely death. The Black Parade, a parade devised by singer Gerard Way, come to take the Patient into the after-life while reflecting back on his short years alive. Citing Queen, The Smashing Pumpkins, The Beatles, Pink Floyd and David Bowie as influences for their melodramatic classic-rock tinged masterpiece, My Chemical Romance continue to exceed expectations - The Black Parade has to this day sold over 1.3 million albums worldwide. Today My Chemical Romance are headlining festivals worldwide, and are set to begin their full tour of The Black Parade in early 2007. Promising a theatrical stage show, over-the-top production with their "longest tour ever", MCR are sure to please many a fan across the globe.